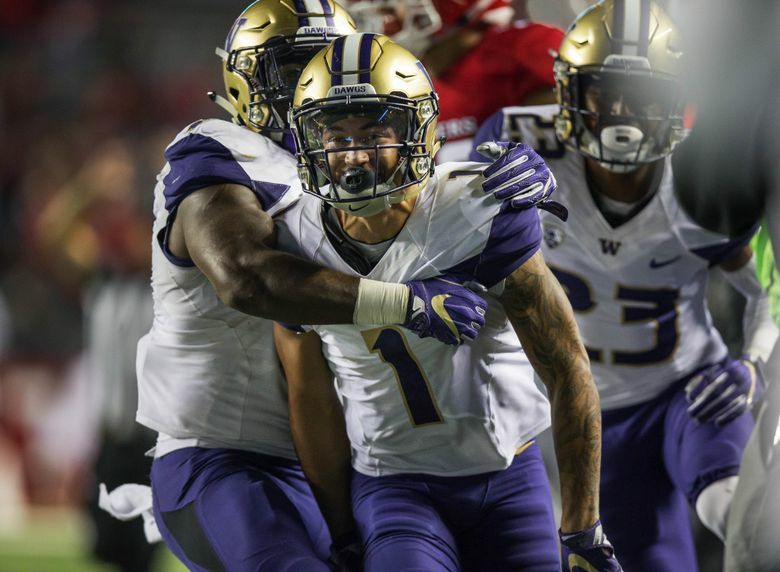 The Huskies secondary should be one of the best in college football again in 2018. The question isn't about talent, though, it's about health. If the key players can avoid serious injuries, opposing passing games beware. The Washington Huskies, entering a season in which they are a favorite to win the Pac-12 championship, open fall camp Aug. 3 as they begin in earnest preparations for their much-anticipated season opener against Auburn. Today, we continue our fall-camp position preview series with a look at one of the nation’s top secondaries. Note: Heights and weights are from UW’s spring roster. OUTLOOK: What else can we say here? Look, the Huskies’ defensive backs are good. They know they’re good. You know they’re good. Everyone knows they’re good. (Phil Steele, in his 2018 College Football Preview Magazine, ranks UW’s secondary as second best in the nation, behind Michigan, and even that might be shortchanging the Huskies.) Taylor Rapp and Byron Murphy have a chance to be high NFL draft picks; JoJo McIntosh and Jordan Miller almost certainly have an NFL future; Austin Joyner likely does, too; and Myles Bryant is one of the more underappreciated players in the Pac-12. (And that’s just naming the 2017 starters.) The goal here, for now, isn’t to pile on with more hype and more hyperbole about this UW secondary. Yes, yes, yes, it should be really, really, really good again in 2018. But there are questions, namely health-related questions. By mid-October last year, the Huskies were without both starting corners (Murphy and Miller), and their absences loomed large in the loss at Stanford. Miller is expected back for fall camp from his broken ankle; and Joyner (calf) should be good to go in August after missing most of spring ball. Joyner is a wild card. The former Marysville-Pilchuck star played well in Miller’s place at one corner in the second half of last season; he’s versatile enough to play just about anywhere in the secondary, but can he find a niche role? STAR WATCH: Murphy Island, anyone? As a redshirt freshman, Murphy made his anticipated debut in the 2017 season opener at Rutgers and promptly picked off two passes in the UW victory. Two weeks later, his season was derailed when he broke his foot in practice and missed the next seven games. He did return in November and was stellar in the Apple Cup and the Fiesta Bowl. The goal now is to put together those types of performances over a full season. If he can do that, he might be tempted to make any early jump to the NFL. BREAKOUT CANDIDATE: Keith Taylor and Elijah Molden were two of the most impressive players during the spring. With Miller and Joyner both out, Taylor held down one corner with the No. 1 defense for most of the spring. At 6 feet 2 and 193 pounds, he looks almost exactly like Kevin King. Molden won the coveted “Best Hands” trophy in April, edging out Taylor and Bryant for the most interceptions during spring ball. That he can play inside or outside gives him a great chance to see more snaps this fall. A year ago at this time, because of the terrific depth in the secondary, it seemed unlikely Jimmy Lake would need to play many, if any, of the incoming true freshmen (Taylor, Molden and Brandon McKinney) — and then all three played last fall, mostly on special teams. Could be a similar scenario this season with Kyler Gordon, Dominique Hampton and Julius Irvin; the Huskies don’t have any obvious need for their services, but it’s probably a safe bet Lake can find a role for them somewhere.